Escape to a paradise of immeasurable depth filled with coconuts, sun & good vibes. Experience a yogi paradise in Feb 2019. An opportunity to receive relaxation and healing through yoga practice and live music, helping you to close off from your normal busy life, to discover peace, balance and harmony. An elegant home with luxury comforts, air conditioning & a huge pool. A true corner of serenity nestled amongst coconut trees & frangipani flowers. Learning to balance our environment & our body constitution is the life science of Ayurveda. Learn about Ayurveda philosophy & experience Ayurvedic treatments with an experienced practitioner. Awake the sense of balance on and off the mat with twice daily themed practices, breathing techniques & guided meditations outdoors and on the beach! On your retreat you will have a chance to taste traditional home coked Goan & Indian dishes. Our food only uses fresh local ingredients, vegan, vegetarian options & fish dishes are available. Visit a different beach every day, from the turtle nesting Galgibag, Butterfly beach or the more popular Palolem. Yoga mat, bikini & coconuts. A bhajan literally means "sharing." A group of local talented musicians will join us & share their devotional music inspired by the Bhakti tradition. This is a time of celebration, dancing & singing. Throughout the retreat a range of ayurvedic therapies, consultations & treatments are offered by Acharya Ajay Sharma are available to ensure every ache is soothed. Stand up paddle boarding is incredibly empowering and fun! One early morning during the retreat we'll teach you how to balance and explore the shores of South Goa, we may spot some playful dolphins too! 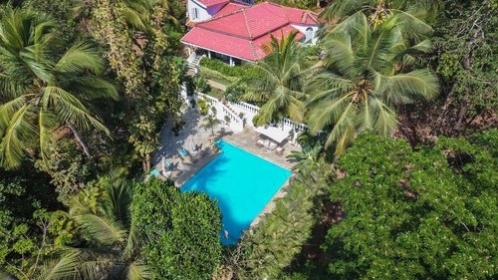 Our beautiful location for this retreat is an oasis of tropical tranquility located in South Goa in a remote fishing village situated in the lush, verdant foothills of the Western Ghats and minutes away from Goa's most scenic and pristine beaches. An unforgettable experience that allowed me time to look within and increase my awareness. I would go again without blinking! At a time of crisis in my life, I couldn’t have wished for anywhere more perfect. Exceeding all my expectations by far, I had time to indulge myself in the beautiful surroundings, reflect and arm myself with life-long skills and, I also had the pleasure of meeting many like-minded people who are now hopefully friends for life. Two weeks was just perfect. I really couldn’t recommend it enough. The Villa is just amazing, cosy and peaceful. It made me feel at home and I would really love to go back one day. And Irina Raileanu, well, Irina is simply the best yoga teacher, always smiling and positive with such a good vibe. This trip has bought miracles to my life. Thank you! Namaste. It was an absolute pleasure to spend a week with 11 powerful, kind and beautiful women and 1 amazing guy. Each one of us was on our own self-discovery journey but it was amazing to share it all together and to get to know some people that I feel connected to for a long time. Definitely worth the experience! The retreat is designed to achieve balance in a light hearted way with plenty of time for sunbathing on the beach, sightseeing, activities & experiences. Classes are suitable for beginners or intermediates. 90 min Morning Practice from 8.30AM & 60 min Beach Sunset Evening Practice from 5.30PM. Each morning we will gather on the beautiful yoga deck at the villa for an envigorating and energising flow yoga class. At times classes will be accompanied by live music, including guitar, bansuri (Indian flute) and more. To follow we will learn and practice the art of Indian voice toning and improvisation. Connecting with our throat chakra (Vishuddha) opens doors to finding your true voice. Your pure essence. Each sunset we will head to the beach for our evening yoga session followed by mantra singing. Through the practice of Bhakti yoga we are able to connect more fully with the divine, and in doing so, we are able to come into resonance with our truth. Our daily brunch buffet is surely the best bit that follows a well-deserved savasana. Each breakfast is varied with healthy Vegan & Vegetarian options, inclusive of daily smoothies & fresh exotic fruit. Protein-packed vegan snacks & fruit are available mid-day as well as a selection of teas & coffee. 3 x Dinners at the villa are lovingly prepared by our villa cook, fresh Goan food Vegetarian as well as with fresh fish & seafood from the local fishing village. 3 x Dinners outside the villa are dining experiences provided to give you a more authentic feel for Goan cuisine. All filtered water, detox & Ayurvedic teas, coffees and fresh juices. Wine with dinner is provided on 3 out of 6 nights. Lunch is not included, however options can be suggested if you'd like to explore the local area. Limited places, small group ( 10 - 14 guests) & 3 facilitators to guide your progress on retreat. Daily Yoga Flows & Meditation classes featuring Ashtanga Vinyasa and Yin postures blended in creative thematic flows & suitable for beginners & advanced. Morning sessions will be in our private outdoor river facing yoga platform & some evening sessions on the beach at sunset. Daily Brunch Buffet & snacks, 3 x Dinners at the villa with wine, 3 x Dinners at selected restaurants. All filtered water, detox & Ayurvedic teas, coffees, fresh juices. 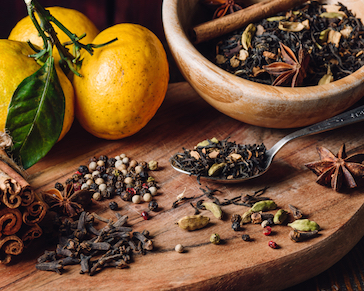 2 x Ayurveda workshops with a Indian Guest speaker & Ayurvedic practitioner sharing his knowledge of vedic science, health, art and culture with specific focus on Ayurveda & health. Ayurvedic consultations & therapies also available. Lunch is not provided for the duration of the trip however a range of options will be available. Local transport such as tuk tuk/taxis unless specified. Flights to Goa or Travel Insurance. Personal Ayurvedic Treatments, Therapies & Consultations are not included but available throughout your stay. India is not a perfect destination. Perfect destinations often lead to boring vacations. This is an invitation on a true journey, of the soul. The retreat is co-facilitated by Abby Poem and Amu Ahava. Together they bring the balance of Shakti and Shiva, the feminine and masculine energies. Their intention is to create a high vibration and healing environment for rejuvenation and transformation. €400 deposit to book remaining balance by Jan 28th. Single supplement applies. Group size 12-15 people.